Electric vehicles are powered purely by batteries, with no gasoline engine. This is different from hybrid electric vehicles that use a combination of a battery and a gas engine for power. Today's battery technology makes it possible to build electric vehicles (EVs) that can go over 200 miles on a single charge with performance that is comparable to, or better than, equivalent gasoline-powered vehicles. We believe that EVs can play a big part in solving three huge problems: transportation's contribution to greenhouse gas emissions, economic dependence on foreign oil, and the national security issues created by sending $700 billion dollars a year to foreign governments. In addition to helping solve the world's problems, EVs bring us an improved way to commute that is convenient, powerful, and fun. For typical daily driving, plugging your car in at night is easier and faster than making a weekly trip to the gas station. With ten times fewer parts than a gas-powered car, an EV has far fewer wear and maintenance issues: no oil changes, no muffler, no catalytic converter, no fuel or oil filters, no timing belt. In fact, there's no need for a transmission! The brakes last longer because the vehicle can slow down by converting momentum into electrical power to charge the batteries instead of wasting that energy as heat and brake wear. Here are facts and answers to frequently-asked questions about electric vehicles, their technology, and their impact on the environment. For gas-powered vehicles, efficiency is represented by miles-per-gallon measurements. That clearly won't work for EVs since they don't burn gasoline. Instead, we consider two things: the amount of energy it uses and the emissions it produces when traveling a specific distance. Here is an efficiency analysis comparing electric vehicles to gas-powered vehicles. The upshot is that electric vehicles use the energy equivalent of a gas vehicle getting over 100 mpg, and even when powered from today's electrical grid -- which is heavy in coal and natural gas plants -- driving an EV will reduce nearly all types of pollution, including greenhouse gasses and the emissions that cause smog. When powered from clean, renewable resources, driving an EV creates no pollution either directly or indirectly. It's a pretty well-kept secret, but major manufacturers sold factory-produced electric vehicles (not conversions) in California in the late 90's and early 2000's. This was due to a California Air Resources Board mandate for zero-emissions vehicles. Once that mandate was eviscerated (due to pressure from the auto manufacturers), the vehicles were no longer made, and many of them were taken back after lease periods ended. Fortunately, many of the Toyota RAV4-EVs were available for purchase. They're still going strong today, and we were fortunate to be able to buy one from its original owner. According to Wikipedia, Toyota made about 1500 RAV4-EVs from 1997 to 2003. The RAV4-EV has a range of 80-100 miles on a charge. Our typical usage is about 40 miles between charges, which takes about 2 hours to return to a full charge. The batteries are NiMH (Nickel-Metal Hydride). The charger is connected to a 240V 30A circuit. Check out our page listing the features we've added to our RAV4-EV! Our favorite source of information on the RAV4-EV is Darell's site (EVnut.com). 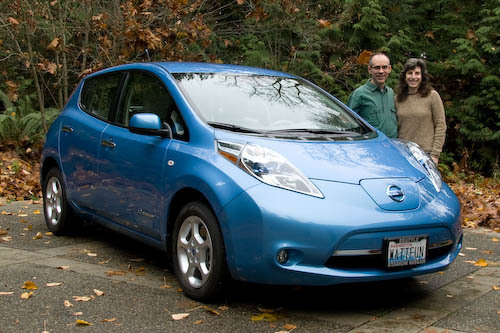 We got a Nissan LEAF in September, 2011. We love it. The LEAF features an EPA-rated all-electric range of 73 miles. It's hard to get less than 60 miles out of a full charge and possible to get more than 100. It's quick and comfortable, seats up to five adults, and has a roomy hatch. It's both fun and inexpensive to drive, no matter what the price of gas happens to be. A review of our first few months' experience is on Tom's blog. We're thrilled that there are now multiple choices for factory-made, freeway capable electric vehicles that are practical and affordable. Things have come a long way since we first got involved with electric vehicle advocacy in 2006. We've documentd a few features we've added to our LEAF. We highly recommend the documentary Who Killed the Electric Car?, which explains a lot about the technology and what might have been motivating the automobile companies. Plug-In America helps promote electric vehicles and has a lot of information about the technology, EV-related activities, and links to all sorts of resources. 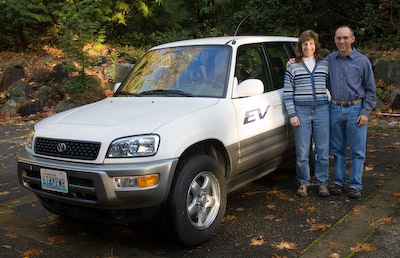 We are members of the Seattle Electric Vehicle Association, a chapter member of the Electric Auto Association.